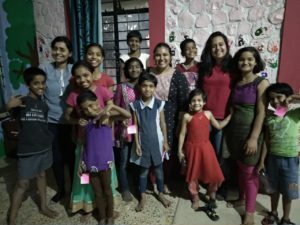 Heena has been volunteering with Bhumi since her college days. She now works at an IT company. Being an introvert, while also being a person who’s the most comfortable among known surroundings, Bhumi has really helped me push the boundaries and increase my comfort zone. It has helped build my inter-personnel skills and the ability to work with a mix bunch of people. It has made me more aware about the society, people and myself. Volunteering with Bhumi has been fun with so many opportunities to explore, learn and grow. As an organisation, Bhumi is very welcoming. Be it your first day as a volunteer or the fact that you have an idea and want to spear head a new project, the organisation always encourages one. So far, it has been a wonderful experience. I’ve observed, learned and grown through the years I’ve been with Bhumi. Spending time with the children, teaching them is one of my favourite things to do during the weekends. Participating in different events, being part of the teaching programme, interacting with volunteers, different centre authorities and change makers really makes me feel proud of the fact that, I am a part of this huge youth driven organisation and each one of us is making a change, however small it may be, but we are. And that, in a way is liberating. It’s like working on weekends and also have loads of fun. There is no manager to report to. It’s your commitment and the trust the organisation has in the youth of this country. I am a volunteer with the teaching project. I teach English. A language is difficult to grasp, especially if you do not use it on a day to day basis. One Sunday class we showed the kids a movie called Three Little Pigs. This one kid, actually read out the opening credits. Not with perfect pronunciation, but she broke the words and managed to read them. This truly was inspiring and a turning point for us. We’ve been teaching at the centre for a good 2-3 years now, and having such outcomes is really wonderful. In the next class, the child I was teaching she told me she wanted to be able to read out like the other girl did, this really was a proud moment for us and a good example of inspiration and positive encouragement. I started volunteering with the Ignite programme, the English project more specifically. I chose the project because I really feel it is the need of the hour. We teach the basics of English initially, and then gradually move towards a more conversational approach. Currently I work as the Project Coordinator for Speak Out in Pune. It has been a wonderful journey, we’ve expanded to four new centres and made improvements in our teaching patterns and have got a lot of valuable learning and feedback which will help improve the project and our impact further on. I have been a part of the Joy To The World and Nakshatra events as well. To see the kids perform their hearts out is pure satisfaction. 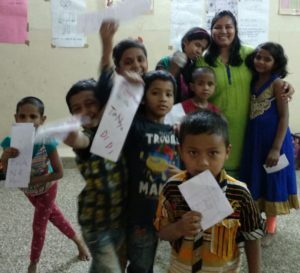 One of the volunteers helped a kid prepare for the Nakshatra competition, and the fact that he performed well and came running to her at the event to express his happiness was just wonderful.